Very well defined facial features help children identify the various races. Made of soft vinyl. Articulated head, arms and legs. Lightly scented body. Sewn on hair. Anatomically correct dolls. This item also has a free digital component found on playminiland.com where you may find lesson plans and downloadable/printable activity cards. You may also access an online game that complements this toy. 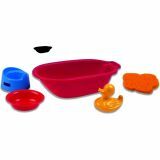 Bath tub with sponge, rubber ducky and other accessories suitable for all sized dolls. This item also has a free digital component found on playminiland.com where you may find lesson plans and downloadable/printable activity cards. You may also access an online game that complements this toy. 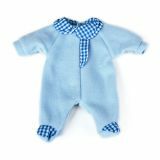 Doll clothes help children to develop manipulative skills, allowing them to become familiar with diff erent fastenings in a fun way. 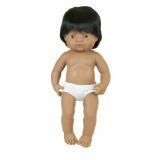 Suitable for dolls up to 125⁄8". Cream Tracksuit with Hood 15" - 15 3/4"
Doll clothes help children to develop manipulative skills, allowing them to become familiar with different fastenings in a fun way. This item also has a free digital component found on playminiland.com where you may find lesson plans and downloadable/printable activity cards. You may also access an online game that complements this toy.